I've never been to New Orleans, much less attended Mardi Gras down there. 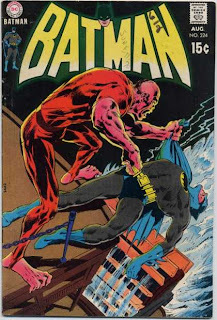 But my earliest -- and strongest -- notion of what it must be like was Batman #224 circa 1970. I've had the issue as far back as I can remember, and it remains the oldest actual Batman comic I own. I haven't actually read the story in around 25 years, and I couldn't tell you much about the plot. Something about a jazz trumpeter dying and his horn being inscribed with a treasure map that some local mob guys wanted. The main villain was the freaky looking dude on the cover. He normally went around in a trenchcoat and hat to hide his deformities, but they get ripped off at some point and he's mistaken for one of the Mardi Gras costumers. Other than that, all I recall is lots of chase scenes throughout New Orleans and a couple of fight scenes where Batman gets shown a thing or two by mutant-boy there. The impression of Mardi Gras that I got from the comic was that it was what amounted to a sanitized, generally benign, 1960s sitcom version of the event. Think: Adam West doing the Batusi. I've since gotten, I suspect, a somewhat more realistic idea of Mardi Gras and I'm not sure it's the type of event I'd even want to experience. (Nothing against those who enjoy that type of thing, though!) I've still never been to New Orleans, but I'm pretty confident that I won't find it in the pages of a 40-year-old comic book! That said, though, I wouldn't mind seeing what it was really like back in 1970!